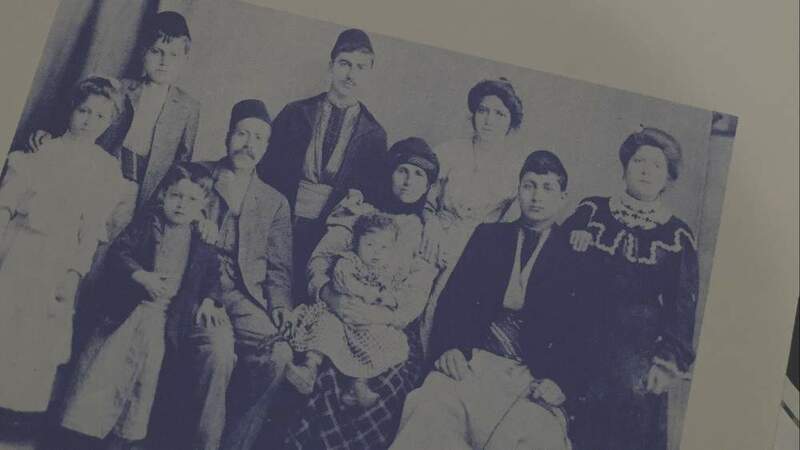 After a century in New England, the country's first Arab families keep tradition and faith close to home. 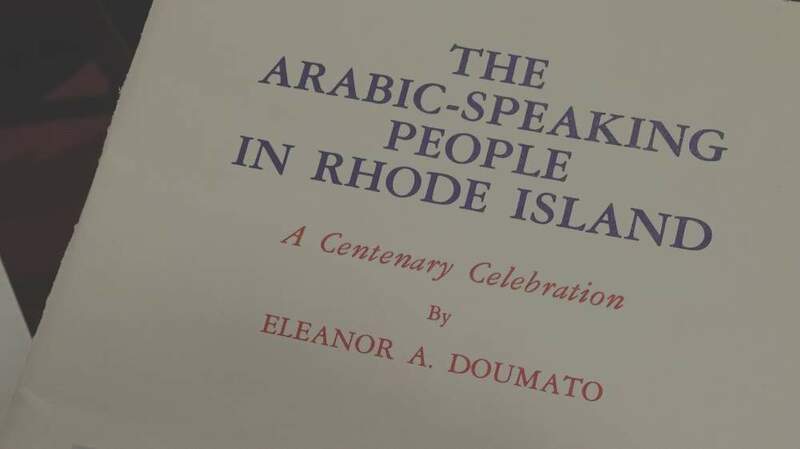 PROVIDENCE, RHODE ISLAND -- More than a century ago, long before American lawmakers and political pundits called for a ban on Syrian refugees, the first wave of Arab immigrants to the United States was boarding ships in the eastern Mediterranean, headed to the east coast ports of New York and Boston. As violence in Syria and Iraq drains Christian minorities, in the former Arab enclaves of New England there are still churches where Sunday prayers are said in Arabic, bakeries where soft bread puffs into pockets in old-country brick ovens, and communities where major holidays are celebrated with recipes from parents and grandparents born under the Ottoman Empire. In the late 1800s and early 1900s - the last decades of Ottoman rule over the Middle East - aspiring emigrants from Greater Syria set their sights on burgeoning industrial American cities. These were more “economic migrants” than refugees, mostly Christian young men and families from what are now Lebanon and Syria. Some accounts from the period also cite religious discrimination and military conscription as motivators for leaving a region that European powers would carve up after World War I. Because of that early immigration, the smallest U.S. state, Rhode Island, now has the most Syrian-Americans per capita. Drawn to the state capital, Providence, they found work in the nearby textile factories and mills of Pawtucket and Central Falls. Today, 69 percent of the United States’ 3.6 million Arab-Americans are Christian, due in large part to that first migration at the turn of the last century, according to estimates by James Zogby, head of the Arab American Institute. That stands in stark contrast to the Middle East, where Christians are less than 10 percent of any country’s population, except Lebanon. “I think the average American conflates Arab and Muslim: ‘All Arabs are Muslims and all Muslims are Arabs,’” says James Zogby, head of the Arab American Institute, who grew up in a Lebanese family in Utica, New York. We're just trying to keep our heritage going. 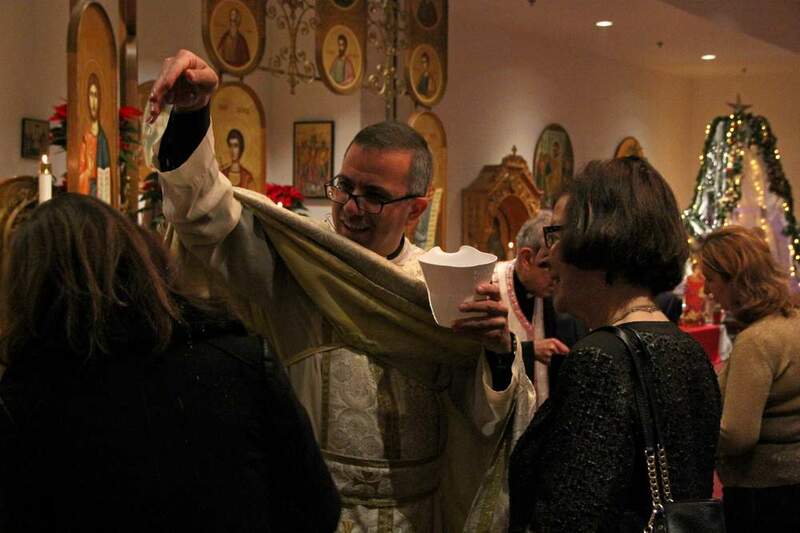 For four generations, the centerpiece of Arab Christian life in the U.S. has been the church. It’s common to hear of a family where the grandparents, parents, and children have all married within the congregation. The new Americans built their lives in similar enclaves, mainly in the country's industrial hubs. Now in his 70s, Frederick Kanakry grew up in a Syrian family in Rhode Island. He cares fiercely about staying in touch with relatives; he plays online games with cousins who fled civil war to Turkey and Lebanon and, by phone, checks on his late uncle’s wife in Damascus. I’ve baptized the children, children’s children, married them - the stability means an awful lot to make us what we are today. St. Basil Melkite Catholic Church, one of five Arab churches around Providence, was first built 109 years ago. And for nearly half that time, Right Rev. Exarch Joseph Haggar has been a priest there. St. Basil's 300 families include several generations of Arab-Americans, as well as newer arrivals fleeing Syria’s civil war. Church leaders estimate about 90 percent of the congregation - including Fr. Joe - are of Syrian heritage, with others from Lebanon, Jordan, and a few non-Arab countries. The parish has relocated several times, and is now based in Lincoln after Arab-American families prospered and moved out of working class Central Falls into the leafy, wealthier suburbs. “We wouldn’t have our roots, our heritage as active in our lives - we wouldn’t have it outside our family,” without the church, says Danielle Boudjouk, a first-generation Syrian-American. The church - it’s not a building. The church is a group of people who serve God, who worship God. Just outside Providence, Fr. 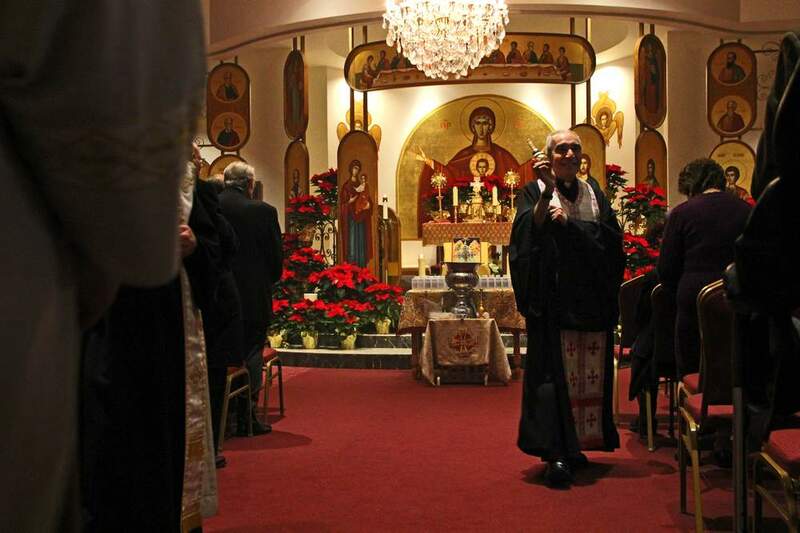 Alan Shaltan is raising his two children steps away from St. Ephraim Syrian Orthodox Church. 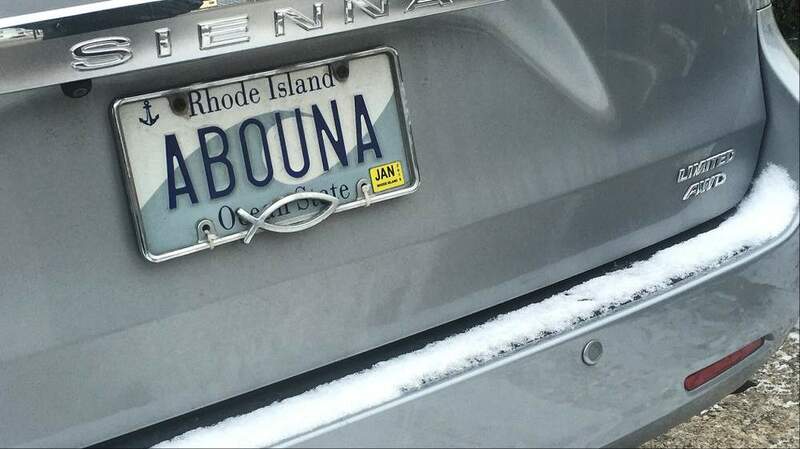 The license plate on his silver minivan reads "Abouna" - Arabic for "our father," as in "our priest." About 100 families belong to the small church along Washington Street. Newer city residents, largely Central American, don’t have much use for an Orthodox church. 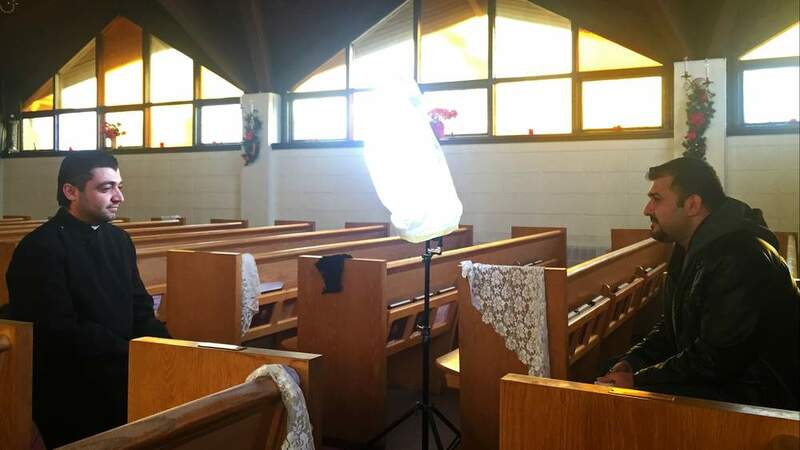 So on Sunday mornings he welcomes about 80 people; dozens of children attend Sunday school. 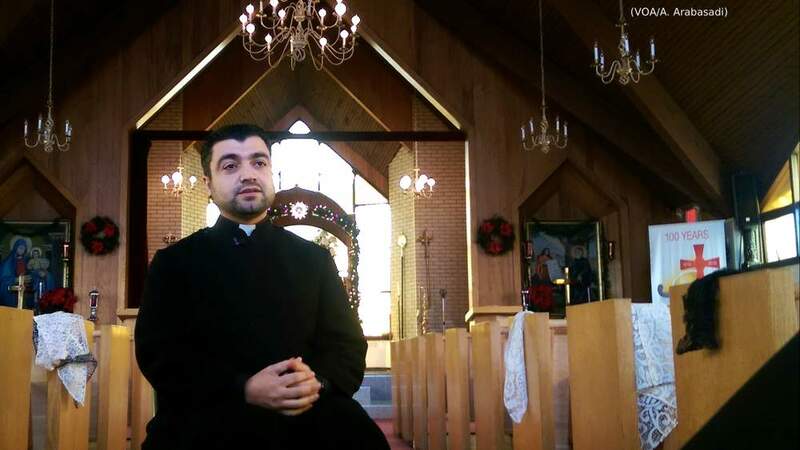 Among churchgoers are several families who fled Iraq in recent years, including parishioners who belonged to his father’s church in Baghdad, St. Mary’s. Born and raised in Iraq, Fr. Alan trained for the priesthood in Syria, where he met his wife. Eight years ago, on a working visa to the U.S., he became the pastor of 103-year-old St. Ephraim. His parents and younger sister stayed behind. The majority of Christians in his father’s once heavily-attended parish in Baghdadhave since fled to safer countries or areas. Others have just stopped coming to church. It’s hard to have faith in “sanctuary” when churches are targets for bombings and clergy singled out for assassination. He worries about refugees in the Middle East and the ones who make it to the U.S. He worries about filling his church. He worries about his family in Baghdad. But he’s one year away from U.S. citizenship. He’s hopeful his father will retire soon and the family can reunite in safer circumstances. He’s hopeful St. Ephraim will be able to serve a community in the U.S. that is struggling so much in its homeland. More refugees could fill the wooden pews of St. Ephraim and, as they have in other industrial New England towns, kick-start struggling local economies. I think the average American conflates Arab and Muslim: all Arabs are Muslims and all Muslims are Arabs. They have no clue there’s broader diversity. Over the generations, as conflicts in the Middle East waxed and waned, and U.S. immigration policy fluctuated, the Arab American umbrella has grown to cover more countries, more Muslims, more minority religions, like that of the Yazidis. “Instead of being, as the right would have it, a ‘hub of terrorism,’ it’s the American institution that they build both to preserve their heritage, and to build the tools to move forward in the country,” Zogby says. While the ties to Arab heritage remain strong, the connection with the homeland is more complicated, at least for Syrians. For decades, a group of men who belonged to the St. Vincent DePaul society through the Arab churches around Providence would raise funds to donate to parishes in Syria. But as conflict escalated, the checks were intercepted or disappeared entirely. They haven’t figured out yet how best to help, and some community members are reluctant to donate to any group in the country, afraid of affiliations in a civil war now in its sixth year. Still, in collaboration with a non-Arab Christian church in Rhode Island, Anthony Brahimsha, the young Syrian-American who grew up in the community, raised tens of thousands of dollars last year for a church in Aleppo. The Obama administration says it will accept more Syrian refugees in the coming years to meet the crippling demand for refugee resettlement. The heads of the Arab churches in the Providence area say they have met to discuss how to welcome them. The church is "probably the only institution outside the family - to nurture and pass on the cultural values of the Syrian people..."
There is concern in the community about how they will be shown, if their faces will be seen. Recent immigrants from Syria have easily understandable worries - they’ve just fled a civil war. But among longer-established families, what is the fear? “You know, there was a period when it wasn’t cool to flaunt that you were a Syrian-American,” says Thomas Sabbagh, who leads the St. Basil choir on Sunday mornings. Why did he decide to talk, then? In the backlash against Syrian refugees in the U.S. following terror attacks in Paris in late 2015, what stood out was in part anti-Arab sentiment, but largely, Islamophobia. Still, there’s long-standing reluctance in the Arab-American community when it comes to public participation, Zogby and his staff note. Even generations after emigrating to the U.S., there is still an interest in keeping a low profile. “This crosses religious and ethnic lines,” he added. “(It’s) that sense that ‘I am what I am in my church and my home, but it’s not part of my public persona.’"
Matt Stiffler is a professor of Arab-American studies at the University of Michigan, as well as a historian for the National Arab-American Museum. He says because of the nativist movement and backlash against the first wave of immigrants from the Middle East -- including the Immigration Act of 1924 that effectively banned immigration from the region into the mid-20th-century - a fear of self-identifying as Arab was passed down. “I think they understood - ‘in the U.S., they don’t like Arabs,’” says Stiffler. “Parents refused to teach Arabic to (their children). They thought it would hurt you. A study by the Arab American Institute as recently as December 2015 found only 40 percent of survey respondents had a favorable opinion of Arab-Americans - deteriorating from 49 percent just five years earlier. Thirty percent of respondents admitted they had an unfavorable attitude toward Arabs in the U.S.
Over here was like my hometown. Everything Lebanese. Lebanese food. Wherever you go, they speak Lebanese. From the Lebanese flags on the price list at Sam’s Bakery, you get the feeling that Georgette Yamin has never worried that people know where she is from. On a weekend morning just over the border, you’ll be elbow to elbow inside the Fall River, Massachusetts, shop with a dozen other customers waiting to order a bag of warm bread and savory meat pies. 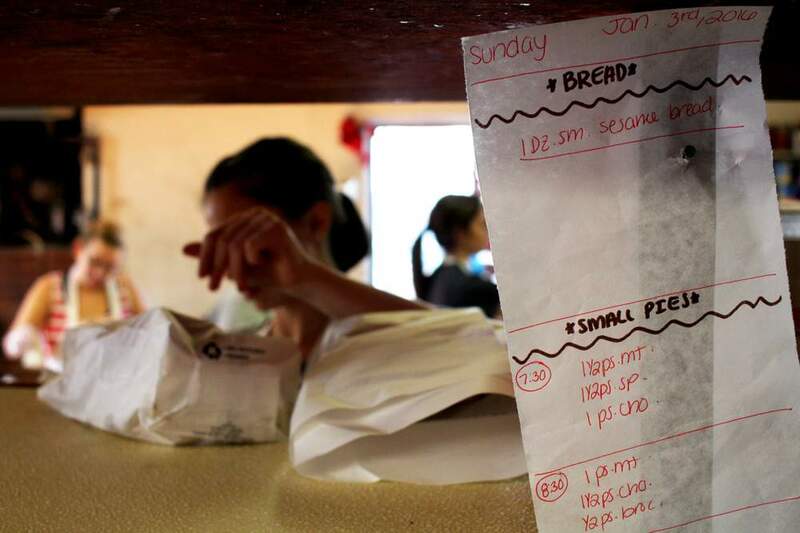 The flour-dusted cacophony in the back of the bakery matches the shouted orders up front, as a dozen employees mix vats of dough for the bakery’s two ovens. 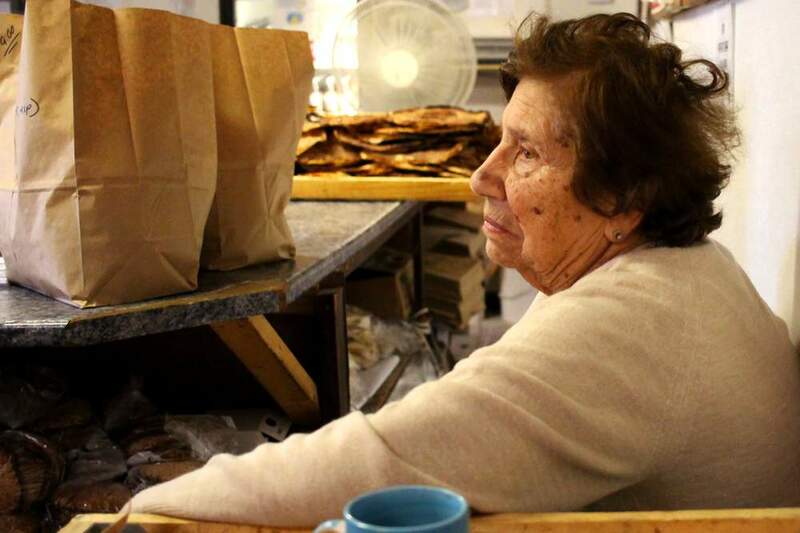 Every day before church, Georgette Yamin (YA-minh in the U.S., but Ya-MEEN in Arabic, she’ll tell you) stops into the bakery she and her husband built with $1,000 in 1961. The ovens crank out hundreds, sometimes more than a thousand doughy circles and triangles topped with spices, meats, vegetables or cheeses. 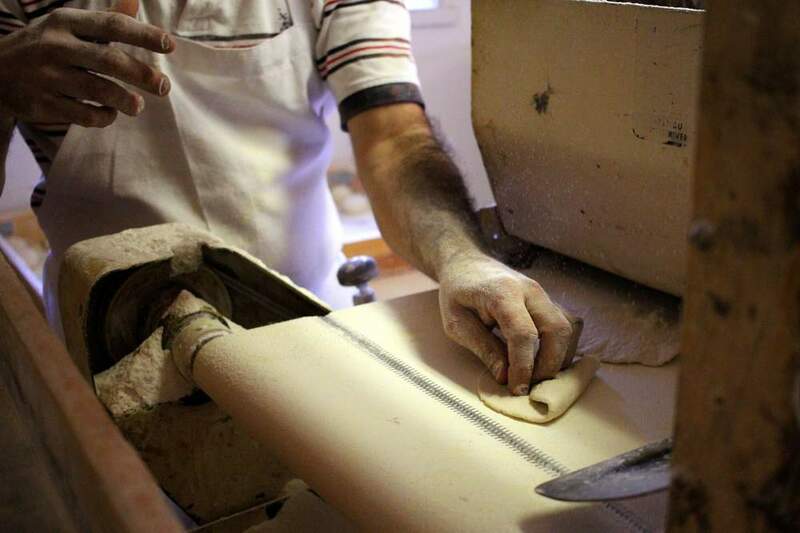 She met her U.S.-born husband Saleem - the bakery is his namesake - as a child in Lebanon. He returned after his military service to marry her. 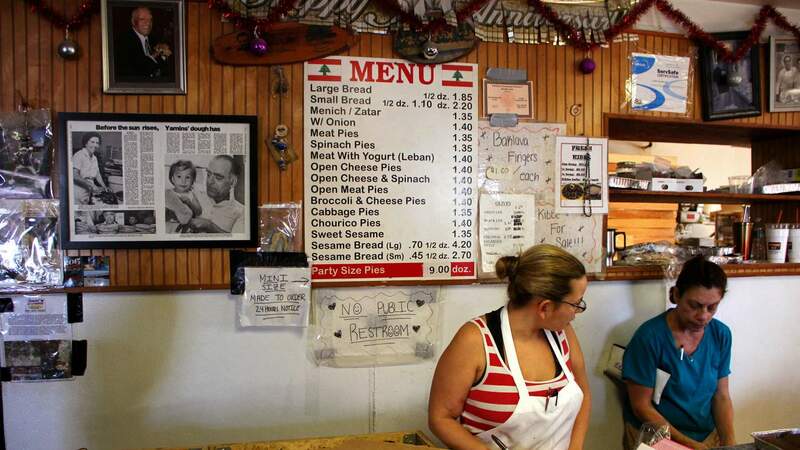 In the U.S., they moved to the thriving Arab-American community of Fall River. When he took a job in Niagara Falls, the couple moved there, but… it wasn’t Fall River. "Over here was like my hometown. Everything Lebanese. Lebanese food. Wherever you go, they speak Lebanese. Over there, nothing!" Yamin recalls, sitting on a stool in the back of the bakery, where flour has settled for the day in a thick cap along the wood floors. So they returned to Massachusetts and opened Sam’s. More than half a century later, the crew - headed by her youngest daughter, Dora Peterson, in the front of the house - knead, fill, and fold dough from early morning to early afternoon. “We used to serve only the Lebanese people. But now it's mostly Americans,” explains Georgette. Does the shop still feel more like Lebanon than the U.S., though? I hope the rest of my life I will be better here in the U.S., because all my previous life is just a disaster. In early 2016, Rhode Island welcomed the state’s first Syrian refugees - 22 people from three families by early April, according to State Department figures. More than 200 Iraqi refugees have also arrived in the last decade. That includes the Christians who joined Fr. Alan’s church, and Muslims like E.
By media accounts, the latest Syrian Rhode Islanders were greeted warmly at the airport. But E.* was met with no fanfare. It’s been so long - 13 years since she was an interpreter for American soldiers in Baghdad, 11 years since she fled to Jordan, three months since she landed in New York late at night with one other family member and took an hours-long taxi ride to Providence. 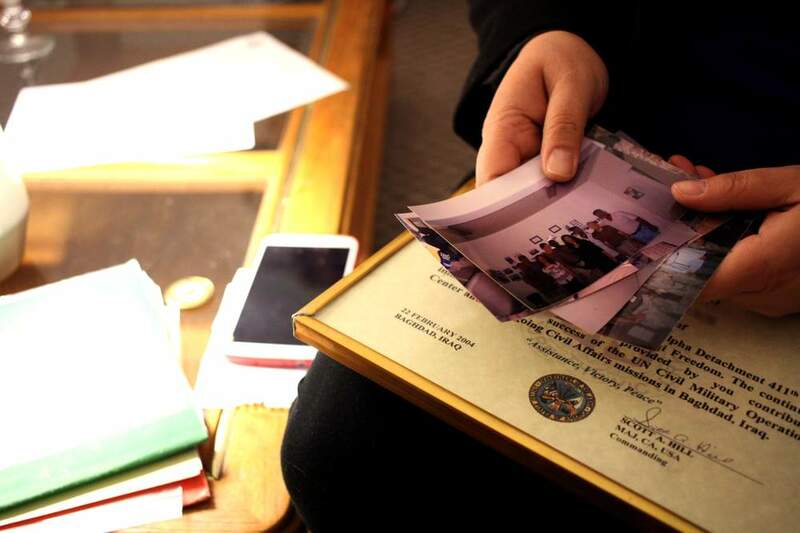 A one-time interpreter for the U.S. military in Iraq, she waited more than a decade to step foot in the United States. Although her first home in the U.S. is in Providence, E. doesn’t know any Arabs from the long-established community there. It’s not on purpose, but she isn’t really looking for it either. She has more pressing needs right now, like a finding a job before her refugee benefits expire. She laughs and smiles easily. But all she can talk about is finding a job. She's in her mid-40s, and has a college degree. Most of her master's degree work is done. The mill jobs in the northeast U.S. have long since closed down. The manufacturing jobs that once buoyed the state's economy-- the ones on which the first generation of Arab immigrants built their communities -- have tanked year after year for decades. In the early 1990s, industries that used to employ nearly 100,000 Rhode Islanders now employ about 40,000, according to data from the U.S. Department of Labor. But unemployment is dropping for the state’s one million residents, who are increasingly involved in education and health services. “All (the experience) I have is out of the U.S. (and) in order to get good position here and good work, you should have previous experience to work in the U.S.,” explains E., who asked that VOA conceal her identity for fear of retribution for her work with the U.S. military. “I don’t mind because I just will start again and do it again… I will start doing whatever is available, and I will build my future,” she says sitting in the kitchen of her apartment in Providence. E. doesn’t want to leave Rhode Island so soon after arriving, and her sponsor - a former soldier who she worked with in Iraq - lives nearby. She has a home the Dorcas Institute refugee resettlement agency rented for her, but no TV yet, so she’s unaware of the animosity American lawmakers around the country have expressed for months against refugees. She’s concerned about her future, yet unfailingly optimistic. There is always the nagging at her soul, though. The feeling that she left behind relatives -- close, important family members -- in Iraq, and it could be years before they are back together. *At E.'s request, VOA has omitted her name, as well as identifying details about her family, for security concerns. Faces and names have been masked in the final photo for additional protection. 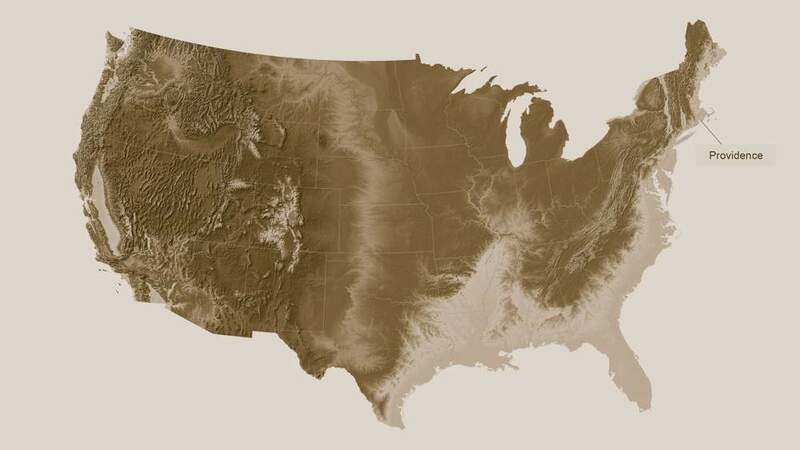 “All Over the Map” is an ongoing multimedia project produced by VOA’s News Center that explores lesser-known immigration stories around the United States. Follow the project: Facebook, Instagram, Twitter. Alhurra correspondent Ali Al Zobaidy contributed to this report.